Dr. Gary Chan is a UQ Research Fellow at the Centre for Youth Substance Abuse Research. His principal research interest lies in the field of substance misuse prevention and the application of cutting-edge statistical method for longitudinal analysis. 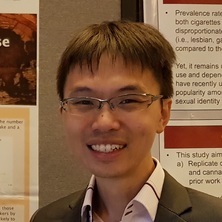 His recent publications have been focused on polysubstance use (including alcohol, tobacco and cannabis) profiles in adolescent populations, examinations of urban-rural differences in substance use, and the epidemiology of alcohol, tobacco and cannabis use. He collaborates extensively with leading researchers in major national and international institutes, including the University of Washington, Murdoch Children's Research Institute, University of Melbourne, and University College London. He has also served as a consultant at the United Nations Office of Drugs and Crime to improve exisitng methods for monitoring global trends of illicit substance production, trafficking and use. This work has made significant impact on how global data will be collected, and these new data will be used by the United nations and many national governments to inform drug policy decision making. Dr. Chan is also a statistical advisor at the School of Psychology, providing statistical advice to academic staff and RHD students. Since 2016, he has also delivered several advanced statistcal workshops at the School on R and multilevel modelling. Informing future policies on cannabis in Australia. Lessons from new trends in the USA and from the history of tobacco control. Non-medical use of prescription stimulants by Australian University students: Attitudes, prevalence of use and motivation. Peer drug use and adolescent polysubstance use: do parenting and school factors moderate this association? Does gender moderate the relationship between polydrug use and sexual risk-taking among Australian secondary school students under 16years of age? Regional versus urban differences in teenage alcohol use: Does parental disapproval account for these differences? The association of puberty and young adolescent alcohol use: do parents have a moderating role? Is there any evidence of changes in patterns of concurrent drug use among young Australians 18-29 years between 2007 and 2010? Campbell, Gabrielle, Nielsen, Suzanne, Lintzeris, Nicholas, Bruno, Raimondo, Peacock, Amy, Chan, Gary C. K., Larance, Briony, Cohen, Milton, Farrell, Michael, Hall, Wayne D. and Degenhardt, Louisa (2017). Cannabis use among people prescribed opioids for chronic non-cancer pain: observations from the point cohort. In: APSAD 2017 Conference, Melbourne, Australia, (24-25). 12-15 November 2017.